Craig Evans outlines the importance of Personal Protective Equipment (PPE) and Respiratory Protective Equipment (RPE) when it comes to handling asbestos. Asbestos removal can be extremely costly. In February this year, a primary school in Birmingham was faced with a bill for £1,000,000 following the removal of asbestos from their premises by contractors. This figure highlights the extremes to which institutions will go to remove asbestos and further reiterates the dangers of exposure, through fear of law suits as much as the obvious medical impact. It means that when it comes down to asbestos removal, the correct clothing and equipment needs to be enforced for tradesmen and they, in turn, need to be well informed as to what the proper clothing and protocol is. With so many buildings still containing asbestos there is certainly much more money to be spent and asbestos to be removed before we will be free of asbestos risks. For the removal process, protective clothing and other forms of PPE are key in preventing dangerous asbestos exposure for removal teams. New legislation talks concerning European occupational safety and the legal necessity of protective clothing and equipment are currently underway, hoping to make PPE and clothing legal requirements and remove suppliers of inadequate asbestos protection products from the marketplace. Another key element important to the removal of asbestos is Respiratory Protective Equipment (RPE), which as of 2012 has been reiterated in terms of its importance, especially in the wake of realisations that dust masks are not ample agents of dust filtration. This article will provide an overview of PPE and RPE according to the Control of Asbestos Regulations in 2012, so as to suggest important ways you can protect yourself and your workers from the dangers of asbestos. Asbestos was widely used as a fire resistant insulator in mid-twentieth century houses and public buildings. It was an effective tool in the cheap construction of houses, not just insulating houses but strengthening them through resistance to humidity and scratching, and also offering protection from extreme heat. Asbestos was seen as a new and exciting protective measure in construction, however, when a series of asbestos related diseases came to the fore in 1985, asbestos was banned both in its blue and brown forms. White asbestos, initially deemed to be less dangerous, was eventually banned in 1999, making all forms of asbestos completely illegal in the UK. The reason behind this sudden aversion was that asbestos was causing serious respiratory diseases for those exposed to asbestos fibres and dust. For those who do come into contact with asbestos, illnesses such as asbestosis in addition to lung damage and shortness of breath can be disabling consequences. Asbestos can be fatal, as those who come into contact with it can go on to develop asbestos related lung cancer and mesothelioma – a terminal cancer which killed 2,500 people in 2013. Asbestos is a hidden killer like no other – its nationwide use for a long period of time in the UK makes it both numerous in its distribution, and, along with a comparative lack of education on the subject, this makes it doubly dangerous to anyone who comes into contact with it. Younger people are more liable to contract lung related illnesses through asbestos, with research indicating that lungs have not reached full cognitive development until around the age of 22. Time has not done anything to lessen the deadly consequences of contact with asbestos either, so it is important to inform and protect an emerging generation of construction workers and tradesmen against the deadly effects. Indeed, asbestos is continuing to cause problems well after its use was outlawed. In 2016, asbestos related deaths in the UK are set to peak. According to official figures approximately 5,000 people are likely to die this coming year as a consequence of asbestos exposure in the UK – that is three times more than those likely to die on the roads – and around 115,000 worldwide. It is especially dangerous for contractors such as builders, plumbers and electricians who are exposed to asbestos on a regular basis, with statistics suggesting that one in five asbestos caused deaths are in construction-related occupations. Asbestos is currently known to kill on average 20 tradesmen a week, a shocking death toll considering asbestos is a substance whose dangers have been known for more than 30 years, and as such, training in asbestos handling needs to be introduced and imposed quickly and effectively. The UK Asbestos Training Association (UKATA) is looking to eradicate the illnesses associated with asbestos and aid in its removal from our houses, as its continued presence is a threat to people’s health. Asbestos is extremely dangerous – we’ve seen that from the continuing health problems it is causing. Even though it has now been banned in the UK, it worryingly remains in many of our buildings. With asbestos acting as the biggest single cause of work related deaths in the UK, it’s vital that all tradespeople and indeed anyone who may be working with or near asbestos is correctly trained and protected to ensure their safety. Everyone should have their home checked for asbestos through surveying to discover how much asbestos material is present because, as it is built into the foundations and walls of the house, it is often very difficult for the average citizen to detect it. There are multiple places asbestos can be found in the home, including pipes, cement, insulation boards, roofing, guttering, and cavity wall insulation, among many other forms of materials essential in construction. The problem with asbestos is that it was largely the ‘go to’ building material in the mid-twentieth century, so it is pretty much everywhere. As disproportionately more houses were built before the complete banning of asbestos in 1999, this leaves much of the population at potential risk from asbestos exposure. There are four main important clothing groups when talking about Personal Protective Equipment; overalls, gloves, footwear and RPE. Firstly, overalls need to be disposable because asbestos dust can cling to clothing and you don’t want to take it home with you. There have been stories of builder’s families breathing in asbestos after the builder brought home overalls covered in asbestos, so overalls are extremely vital. They must be disposable and only used once, disposed in the correct way as asbestos waste, or under the grouping of hazardous/special waste. Cotton overalls need specialist cleaning because they hold dust within the material, so they are best avoided. If the overall cuffs are loose, seal them with tape. It is important that the overall legs go over your footwear and are never tucked in, as this can let dust into the footwear. The hood of the overalls should be worn over the RPE straps to create an airtight effect inside the overalls and stop gaps between glasses, respirator and hood. Type 5 disposable overalls (BS EN ISO 13982-1) are advised by the HSE Control of Asbestos Regulations as they provide protection from airborne particles and fibres. They are also, unlike cotton, not made of material that will retain dust and fibres. It is a good idea to have several pairs of disposable overalls available during work, and as dictated by the regulations, outdoor work will require overalls made of waterproof materials. It is recommended that workers wear overalls that are a size above their usual clothing size. This is to allow full range of movement while minimising any threat from fabric tears. Clothing worn underneath protective layers should be fully covered. As anyone who uses protective clothing in this way will know, such PPE is not made of lightweight, breathable material and it can get very hot and uncomfortable to work for extended periods. Common sense is needed in these situations, based on the risk assessment and how long the work is expected to take. Even the very best PPE can only work if it is actually worn, so training is essential so that those using PPE are aware of the dangers of being complacent when it comes to using PPE, or not wearing it correctly. Training is the key to ensuring that tired or busy employees are not tempted to cut corners at critical moments and realise the importance of using proper PPE when conditions dictate that they do so. If you wear protective gloves then single-use disposable gloves are integral. Wearing other forms will attract asbestos dust and cling onto your gloves, if you have to use latex gloves then only ‘low protein powder-free gloves’. Gloves that are used should, again, be disposed as asbestos waste. For footwear, laced boots should be avoided as they are difficult to clean and therefore more dust is likely to be retained by the materials. Boots are preferred to disposable overshoes however, as these overshoes can cause slipping. Rubber boots are a popular choice of footwear. They do not have laces or fasteners which can trap asbestos dust or fibres and they allow shoe covers to be used, as rubber boots do not wear through them as easily. Rubber boots are also easier to wash and re-use at the end of a project, although they must be checked carefully to ensure no debris remains trapped in the tread. The recommendation is to use all disposable PPE because while some items such as boots can be cleaned, workers must ensure all such reusable PPE is checked carefully to ensure no asbestos is leaving the work area. Any equipment that cannot be cleaned must be disposed of as asbestos contaminated waste and this is easier to do if not tempted to keep a recently purchased expensive pair of boots. Another issue not commonly addressed is that of women and PPE. As PPE must fit correctly, this means women cannot usually just adopt smaller sizes designed for men and employers need to bear this in mind, as PPE cannot be expected to protect workers from hazards like asbestos if it does not fit. 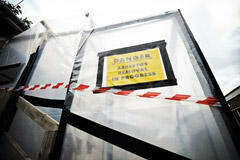 Simply rolling up fabric to fit in such situations risks trapping asbestos dust in the folds, (not to mention getting caught in machinery) and is not an option. For men and women, rarely is ‘one size fits all’ the safest option. In summary, employees must be trained in the correct use of PPE. It must be fit for purpose (made of material that does not readily either retain or permit penetration by asbestos dust) and fit in such a way that asbestos fibres are prevented from reaching the clothing and skin under the PPE. Old PPE is also a risk. Any PPE being reused must be checked carefully and replaced if damaged or torn. Finally, always choose products with the CE mark – in accordance with the Personal Protective Equipment Regulations 2012. Reputable suppliers should be able to advise. RPE is one of the biggest trouble areas when considering asbestos exposure prevention. The traditionally used dust mask is completely inadequate as protection against respiratory related diseases such as mesothelioma. It does not properly filter dust and, in fact, gives a false sensation of safety when handling asbestos, an approach which inevitably leads to mishaps. Reports of untrained people doubling up their dust masks is also worrying, as asbestos dust can be trapped in between the masks and still does not protect the nose and mouth properly from inhaling dangerous dust. When dealing with asbestos, only a suitable respirator will do. HSE standards dictate that respiratory masks must be well fitted and have an appropriate P3 filter, so as to not allow any asbestos dust particles around your vital breathing organs. There are several types of RPE available and these different respirators are entirely dependent on the task at hand and type of work being done. Disposable respirators, half mask respirators and semi disposable respirators may be fine for unlicensed work and work of short duration, with the basic and most popular disposable model being the EN149. For work of significant duration and continuous asbestos exposure, however, non-disposable RPEs are vital. These high powered respirators are usually required for licensable work with asbestos and with trained specialists. The common problem with unlicensed, non-trained contractors is that they are not equipped or trained for asbestos removal – and do not have the correct respiratory devices – meaning that they are vulnerable to inhalation of dust. RPE also needs to be fitted tightly before work can commence, as the consequence of loose masks is the allowing of asbestos micro-fibres into the mouth and nose. Everyone that uses both PPE and RPE needs to be fully trained in the correct protocol and in the equipment used. In recent cases of prosecutions, buildings had been found to contain friable asbestos in insulation, spray coatings and insulating boards which were removed by innocent trades’ people who were untrained and therefore ignorant to the life-threatening dangers of asbestos removal. Common mistakes include removing the respirator before leaving the contaminated area, and thus allowing asbestos to build up inside the mask. The hood of ones’ overalls must be placed over the straps of the aforementioned respirator and glasses must be put on afterwards. It is key that there are no gaps in between the mask and the face. What is most important about RPE is that employers have properly trained and prepared their workers with standards that are very much in-keeping with the Control of Asbestos Regulations 2012. This includes knowing when equipment is malfunctioning, how to fit equipment, when to change the filters and also in checking the valves of the respirator. If there is any point where the respirator is seen to not be working perfectly then the worker must leave the area of contamination, as when it comes to people’s welfare, no steps or cautions can be extensive enough. For all PPE and RPE it is important that the equipment you use is in good shape. All items should be cleaned if not disposable, and clothes that are disposable need to be removed under the classification of hazardous/special waste. This means items must be double bagged and locked with a zip, which needs to be taken away by licensed contractors. These contractors can also clean clothes that have been contaminated with asbestos dust and can be contacted online or through the local council. If you carry asbestos contaminated clothing or PPE you have to comply with the Carriage of Dangerous Goods Regulations and a special red label must be attached to indicate the toxicity of the PPE. Asbestos disposables should at no point be illegally dumped. It is high time that asbestos is taken seriously by all. While the majority of tradespeople comply with the legal requirements set out regarding asbestos, some still feel they can cut corners by playing fast and loose with asbestos. Especially regarding younger workers who are not physically or psychologically prepared for the dangers of asbestos, there needs to be a filter down information system in place, and protective clothing is the start. There are so many stories every year about tradespeople and other individuals in positions of responsibility flagrantly ignoring the dangers that asbestos presents and the message is simple – this has to stop. Not only are they putting themselves at risk, they are also putting others in danger too. Anyone from colleagues to friends and family can be affected and when it’s so simple to sidestep the dangers asbestos prevents by using the correct RPE and PPE, it is everyone’s duty to ensure the correct procedures are followed.